Hi! Kim West, The Sleep Lady. And today, I’m going to help Hailey, whose toddler climbs out of the crib. 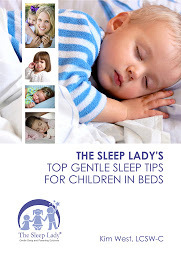 Here is what Hailey emailed in: “My active 18-month-old daughter has been an amazing sleeper. She uses a pacifier and we had always had a pretty solid routine: bath, book, bottle, into the crib, music, saying night night and walk out the door while she is still asleep.” I think you mean awake, hopefully. “Sometimes, she’d wake in the middle of the night. She either finds her pacifier on her own or we’d find it for her, but that was not a common thing. A week ago, she decided that she didn’t want to be in her crib ever, screaming with intensity and then, she learned how to crawl out with ease.” Uh-oh! “The crib was a joke. We had to bring out my son’s toddler bed to make sure she wouldn’t hurt herself and we put her in it. We gated the door to her bedroom so that she can’t get out and we baby-proofed her room. I know this will be a transition, but right now, we’re dealing with her waking up at 3:00 a.m. and refusing to go back to sleep. After a few nights, we got her to stay in the bed but my husband and I are taking turns sleeping on the floor next to the bed to comfort her. We say nothing and maybe rub her back if she allows it, maybe read a book to calm her down. She falls asleep and wakes up every ten minutes hysterical. “I tried walking out the door, kissed night night, here is your pacifier, here is your blanket and we always have since she was three months old, but she cannot be comforted. I fear that she has gotten used to us sleeping on the floor plus the intense screaming is scary and seems unproductive and I don’t want her to wake up my son. Wow! Hailey, you have a lot going on here. I would do the best I can to answer this toddler sleep problem. So, first of all, I noticed that you said that she has a bottle before bed and I’m assuming you meant you used to put her in awake and you would leave. Again, I just want to make sure that she is not getting too drowsy with that bottle in the dim light with a lullaby and then you left the room and she really didn’t master that skill of putting herself to sleep. And then, as she got older, she woke up and it was like, “What? How did I find myself in this crib? Last thing I remember, mommy was giving me a bottle and we were having music and I was kind of drowsy and I didn’t mean to fall asleep on the job but I did and now I find myself here and I’m panicked.” Okay. Not uncommon, especially with 18 months old and perhaps that’s what instigated her climbing out of the crib. So, you have a couple of options. If you want continue with the crib, know that she is really young and that she probably does not understand to stay in her bed quietly all night long. Clearly, a sticker chart is not going to work at this age. And I do find that a lot of children this age just find the freedom without a crib is too much and they can’t really handle it.They don’t know what to do and they become quite hysterical, as you were saying. I previously (in the video) mention using a crib tent, but those have been taken off the market in the U.S. There are a couple of things you can try if your toddler climbs out of the crib. They could have a sleep sack and of course, move the mattress down lower. You can stay with her in the room so that you can also make sure that she doesn’t hurt herself and move out. So, that’s one definite option. You can even put a teddy bear on the corner and a little Tupperware bowl, put them all in there and before her bedtime say, “This is where your pacies are, honey.” And then direct her towards them. Don’t get them and put them in her mouth because that’s a downward slope journey for sure. Make sure that she is well napped. In the middle of the night, when she wakes up upset, you go to her, you say, “You have to stay quietly in your bed,” night night, a little hug and a kiss and say, “There is your paci over there, lie down”, a little stroke and then stay sitting upright. So, again, things are going to get worse before they get better, particularly at this very young age. You have to stay consistent, follow it all the way through and don’t stay too many nights in the room. It should be three nights by the bed, three nights by the door, three nights on the other side of the gate. If at around two weeks you’re feeling like there is very little progress, that might be your sign that your child really is too young to understand. You might decide to reconsider getting that crib back out. Okay. I hope that helps. Good luck!